Special effects are all about creating a wow factor. While classic effects like pyrotechnics will always entertain, a creative approach to special effects allows you to go one step further to amaze and delight your audience by putting on a spectacle they haven’t seen before. There are some truly sensational new special effects trends in the events sector right now, so take inspiration from the latest original SFX innovations. Special effects are getting bigger. Not only that, they’re becoming more extravagant; why stick with fireworks when you can add in flame jets and confetti for an extra layer of excitement? With the events world becoming more and more competitive, it’s become a race to offer the biggest and most impressive SFX in your sector – so if you’re in any doubt, just remember: more is more! Today, manufacturers are reacting to the demand by offering a wider and more comprehensive range of products for all occasions. It’s a special moment at the beginning of any Cup Final; before the players take to the pitch, the pre-match entertainment can really set the scene and build up the sense of occasion. In the old days, pre-match entertainment used to be a short and sweet affair, with a show lasting maybe 10-15 seconds. These days the trend is for pre-match entertainment to be an attraction in itself, with the special effects often accompanied by bands and music performances and lasting for several minutes. Special effects are a great way to get your name up in lights. The latest special effects trends go one step further for brands, offering even more opportunities to shine. If you want to go big on your branding, there are more ways than ever before to get your name and logo noticed. 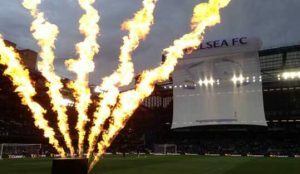 Check out the flame attached, branded finish line we created recently, and the amazing pyrotechnic rugby post structure that was created for rugby players to run through. Pop-up events have been trendy for a while, taking an empty shop or space and transforming it into a unique and time-limited attraction. With all eyes on a pop-up, high-quality special effects can inject the wow factor you need to lure people in. A recent product launch we worked on used rain curtains and bubble tubes to stunning effect. Outdoor pop-ups and festivals can employ light shows for a truly enchanting display. These days, special effects aren’t confined to football and rugby cup finals, like they were in the past. Now, you’ll find flame jets and fireworks at all types of event; whether it’s badminton, strongman, diving or distance bike rides, literally any event can add a touch of flamboyance with the right SFX. If you’re branching out into special effects for the first time and need some tips on where to start, check out the effects we can offer for live events and social occasions. Or if you’d like to chat with our experienced team, call us on 01707 269 566 to discuss your special effects requirements.